With gorgeous dancers in tow, a santa hat-wearing camel and Lekiddo's signature smile, the It's Christmas video invites you to a fun and surreal celebration of all things Christmassy. Nothing is held back - it is a full-on assault of sheer joy. 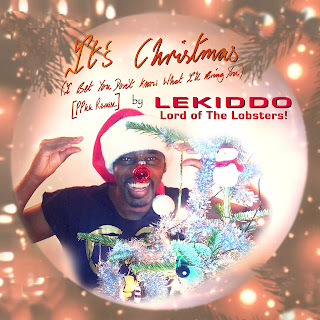 The video also shows how busy Lekiddo has been this year on the festival circuit with footage bouncing along of audiences enthusiastically participating in the dance moves of an unmistakably Christmas song in the British summer. And everybody involved looks truly elated and it is wonderful to behold the sense of ecstatic togetherness. Brighten up your morning and check out the video here. It will give your party playlist the sparkly makeover it has been crying for. It's Christmas (I Bet You Don't Know What I'll Bring You) [PPkk remix] is available on iTunes, Google Play and Amazon.